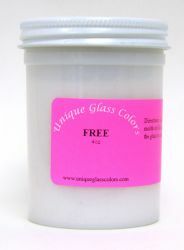 FREE is used to allow the glass to move "freely" on the surface as it expands and contracts while being fired. The best way we have found to apply FREE is to place it in an old cotton athletic sock and use that to dust the surface before placing glass on the surface. Especially helpful when slumping or draping glass over forms. Available in 3.4 oz and 16 oz jars.